NOTE: This review contains SPOILERS. If you have not yet seen Star Trek Into Darkness, it is strongly recommended that you do so before reading this review. I’ve been thinking a lot lately about the release of J.J. Abrams’ first Star Trek film in 2009, and what it meant to me personally. Not only as a huge fan of the franchise, but as someone who prefers the situations and characters of the original series (“TOS”) over all others. Basically, the 2009 film reignited my passion for original Trek in a way I’d not felt since I was a child. When I was a very young kid, the episodes and films featuring Captain Kirk, Spock, Dr. McCoy and all of the others broadened my imagination and helped to shape my perceptions of philosophy probably more than anything else (except maybe Superman). Full disclosure: I was born at the end of the eighties, and the newest adventure for the original crew, which also happened to be their “last ride,” was released in 1991, just after I started preschool. In many ways, by 2009 I had been waiting quite literally my whole life for the return of the crew I’ve always loved the most, and one of the reasons that I hold the 2009 film in such high regard is because, as pathetic as it might seem to someone who isn’t a fan of Star Trek, it gave me my friends back. I’d be lying, though, if I didn’t say that something was missing. The best Star Trek stories always had an allegorical message embedded in the narrative, and for whatever reason this was largely absent from the last film. The thing that made me the happiest with it, though, was that the characters were all preserved. We were left with a sense of hope that the crew had finally been assembled, and that things were ready to get started in a way that most fans were familiar with. In my opinion, one of the best aspects of Star Trek Into Darkness is that it didn’t lead off with this. Instead, early on it sets up a goal that fans are all very familiar with (namely the five-year mission), a goal which has no rigid structure once it’s reached. It builds up to it, rationalizing a lot of criticisms Star Trek fans had about this iteration of the series, while telling a new story with a few parts of familiarity (exploration of new territory) and a grander scale that was granted by revisiting the franchise’s greatest adversary. Before we get to that revelation, though, let’s talk about what returned from the last film. Director J.J. Abrams amps up a lot of the stunning visuals that set the last film apart from so much other sci-fi, but here his stylistic influence seems a bit more tempered. 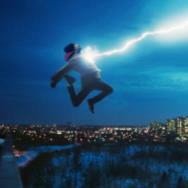 The common recognizable component of the last film, the lens flares, seem less pronounced. More than the last film, though, the visuals are vibrant, kinetic and downright gorgeous. From a pacing standpoint, the film is nothing short of relentless. It's an assault with one crisis or action beat after the other, but to me it never felt exhausting. Abrams really lets each scene play out rather naturally, at least as naturally as they can, before inserting the onslaught of visual stimulation and frenetic pacing. Every so often, that pacing is interrupted by more tender moments between characters, and it all coalesces into a film that doesn't ever feel like it's disruptive. On sheer space action alone, Abrams is the best in the business, and I'm eager to see how that carries forward into his future projects. The cast, conversely, steps back into their roles with tremendous ease, even resembling their original versions from the TV series and previous films more than they did the last time around. Chris Pine steps back into the role of Captain James Tiberius Kirk, and I really felt that this time the good captain looked far more familiar to his longstanding characterization than he had in the previous film. While it was necessary for the last film to drive home Kirk’s penchant for rule-breaking, in this film he was a bit more subtle, more tempered, and even warmer. While he never stoops to caricature of William Shatner, more familiar writing combined with a well-rounded delivery tempo on Pine’s part made Kirk more familiar in this film than he was in the last. This is a testament to his casting, because while it would be so easy for a lesser actor to spoof on Shatner, Pine looks deeper and believes in what he’s saying, and what he’s doing, and it’s that belief that inspires loyalty in both the audience on our side of the screen, and his crew on theirs. 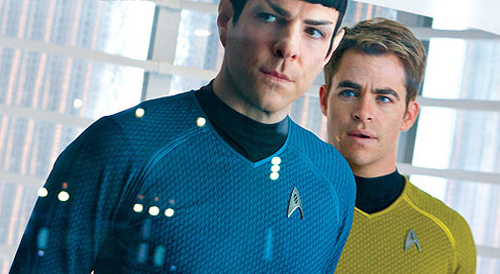 Zachary Quinto really came to work as Spock for this second installment. While playing arguably the single most highly identifiable franchise character for this new iteration, Quinto’s Spock is altogether familiar and surprisingly different. In the original series, Leonard Nimoy’s Spock governed his passions in a far more rigid and restrictive way than Quinto does, and while this has the potential to be off-putting to some Trek purists, the fact of the matter is that the young Spock of this reality has to contend with far more emotional turmoil than his “Prime” counterpart ever did. In this film, Spock is forced onto an emotional roller-coaster that he is not particularly well-equipped for. Still reeling from the loss of most of his people, his planet, and his mother, Spock is forced even further down a path of inner distress when confronted with another heavy loss: that of his burgeoning best friend. While that kind of turmoil may not have been as outward in the past as it’s been in these last two films, I definitely see it as valid, and Quinto is practically perfect in balancing the stoic nature of his Vulcan half and the occasional fury of his human genes. I already thought very highly of Quinto as an actor, but this film has increased that admiration quite a bit. The other members of the cast still maintain everything that made their performances in the last film so good, with the largest increase in a supporting role going to Simon Pegg’s Scotty. This time around, Scotty has a bit more central importance to the overall story, and Pegg manages to maintain the fun that he’s known for while still giving service to the unmatched brilliance that Scotty has aboard the Enterprise. Karl Urban returns as Dr. McCoy, irascible as ever, and some strong writing accompanying Urban’s great timing and emotional truth make for a very compelling performance. I just wish they’d used him more. Zoë Saldana has a bit more to do as Nyota Uhura, getting a little more physical and providing some of the greater moments of levity due to her strained relationship with Spock. That levity gave way to some of the better dramatic moments between the two, and Saldana really felt like the emotional core of the film especially by the time we reach the climax. 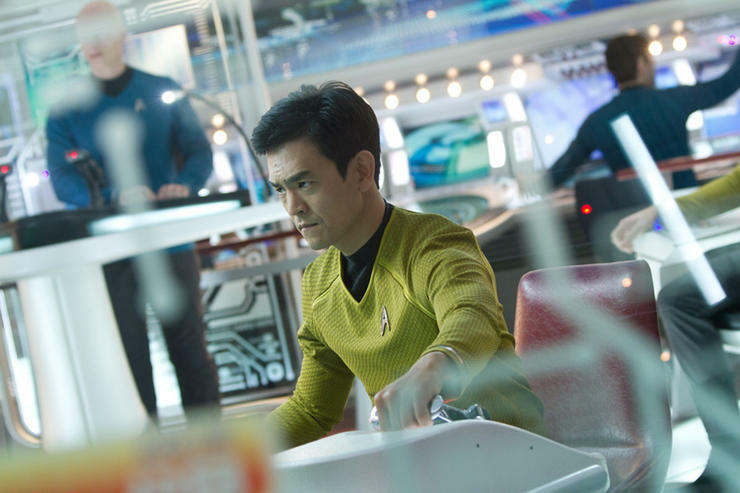 John Cho gave this Star Trek fan a few chills when his moments in the script foreshadowed the destiny that we know awaits Hikaru Sulu down the line. When he gets his first taste of the “big chair” early on and stares down the Klingon homeworld with determination, his display of confidence and competence makes you believe that there’s no better pilot in the fleet, and perhaps no greater destiny than his. Anton Yelchin got a bit of a promotion over the course of the story as Chekov, and his intense eagerness and heroism definitely made for a great deal of fun. Alice Eve brings to life Dr. Carol Marcus in the alternate reality, who most eagle-eyed Trek fans know is the mother of Kirk’s son David in the Prime timeline. 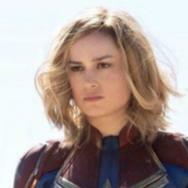 While she could’ve been used to greater effect, and her underwear shot was a little too blatant, I was satisfied with her casting, and I think she’d be a welcome addition to the crew in a future film. Peter Weller as Admiral Marcus definitely helped fulfill the rule that most Starfleet admirals are pretty damned evil, and his role definitely played into the overarching narrative and thematic aim a lot. More on that later. Bruce Greenwood’s return as Christopher Pike was fun, inspiring, and heartbreaking, and although his return was brief, his place in the story and his performance had the reliability and reassurance that made his place all the more important by the time the Enterprise sets off to its new adventure. And now we arrive at the shocker. The point in the review where I have to take a big mea culpa, and admit how wrong I was. 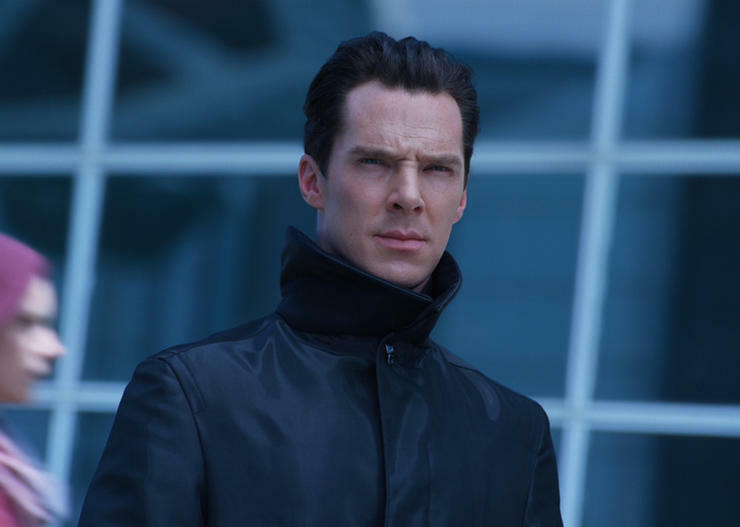 For those of you that followed the Star Trek Into Darkness Countdown, a few months ago I expressed my confidence in the fact that Benedict Cumberbatch’s character would not be that most sacred of Star Trek villains, and I was proven very, very wrong. John Harrison wasn’t the godlike Gary Mitchell, wasn’t exactly a new creation, and yet still managed to be a total shock. For the first time since 1982, movie theaters across the world are beholding a new plot by the one and only Khan Noonien Singh. Outside of casting to physical type, it’s very easy to see that both the screenwriting and Cumberbatch himself are very true to the tenets of what made Khan such an unforgettable villain in the first place, not only in franchise history, but in movie history. 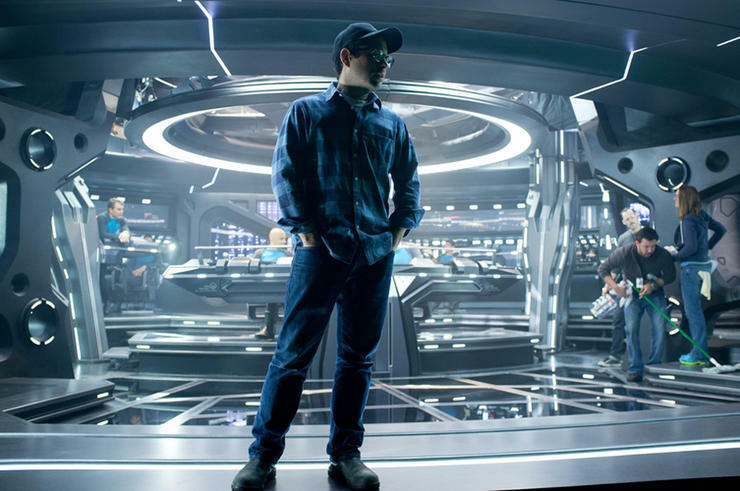 While some people were likely craving a new villain, Khan adds an instant amount of legitimacy and intrigue to this film as a new Star Trek film that certainly attempts to aim high. Cumberbatch himself is a revelation, with such power, anger and belief in his eyes that it’s very difficult to dispute the power he wields, and the pall he casts over the entire story. 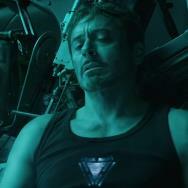 The eponymous “darkness” that the film travels into can likely be attributed largely to Cumberbatch’s Khan, though the larger allegorical message is responsible for a great deal of it. What about Khan’s usage? Was it a good idea? Yes, it was definitely a good idea. The same way I chose not to complain in 2008 when the Joker was reexplored in The Dark Knight, I’m happy beyond words that the single greatest Star Trek villain in existence gets another turn to astonish us with his brilliance, and shock us with his brutality. 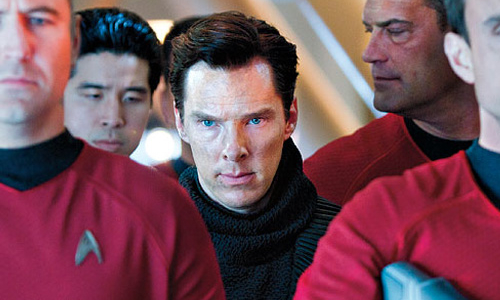 Cumberbatch’s take on Khan wasn’t a retread of the character that Ricardo Montalban made famous; it was a new take, colored with a disdain for the protagonists not had in the Prime timeline because of his usage by Starfleet. With the Federation becoming more militarized in the film, is it any surprise that the most brilliant tactical mind to ever stare down the Enterprise was in large part responsible for it? To me, this fits in with some of the greater elements of Khan’s abilities as an adversary to Kirk and his crew, and is a great jumping-off point for the good captain to reexamine what he, and his Federation, have really let themselves become. 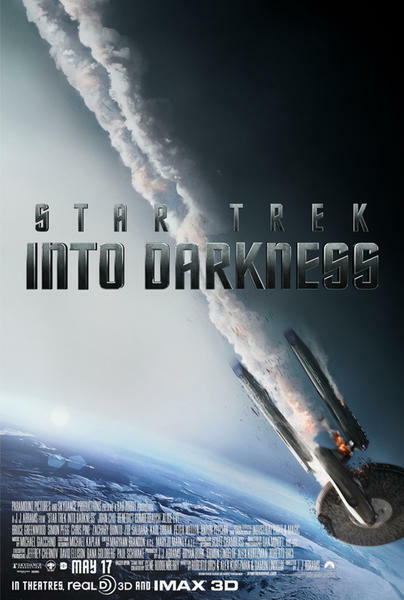 Into Darkness posits a United Federation of Planets so shaken by the destruction of the planet Vulcan in the last film that a secret section of Starfleet Intelligence started exploring unknown regions of space not for the sake of exploring, but in order to find new weapons to exploit and new technologies to defend themselves with. As a result, Starfleet has lost its way, a fact acknowledged by more than one principal cast member. “This isn’t what Star Trek is supposed to be? !” Of course not! The movie knows it! They became so terrified about what was over the horizon that they retreated in fear of it, waiting to kill whatever was out there. That’s not the Federation that I and so many fans look up to, and in part, that was the driving tragedy behind much of the film: the human spirit of exploration and peacefulness was drowned out by a ruthless terrorist who really hurt us, in a way we could only previously imagine. If that sounds familiar, I think it’s supposed to. 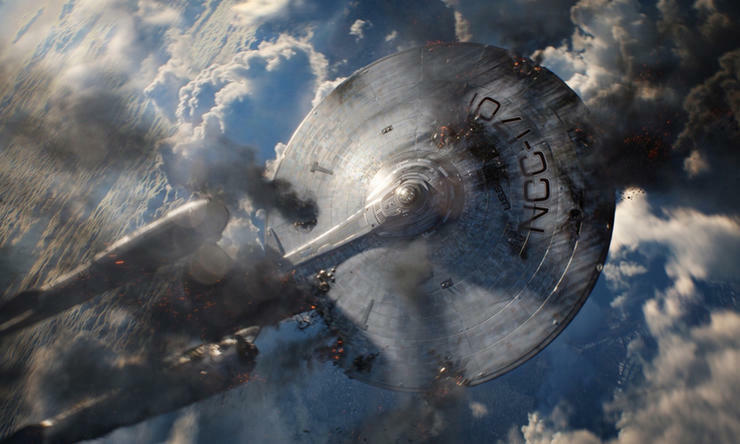 The resemblance between post-Vulcan Earth and post-9/11 America is hard to ignore, but like other great Star Trek stories, the allegory presented in the film is not an admonishment of history. In fact, it’s an alternative. The spirit of exploration has always defined the crew of the Enterprise, and by the end of the film, when they finally made their way out of that dark tunnel, what was waiting on the other side was a bright, renewed promise of the exploration that gives hope to tightly held ideals like peace, and the inherent, insatiable desire for humanity to learn. In the end, the title of the film is completely wrong for the story it's aiming to tell. Into Darkness is just the beginning of the film. What's waiting for them on the other side is the collective destiny of mankind to explore, and it's through that exploration that we find not darkness, but light. Instead of aiming our guns at the dark uncertainty over the horizon, let’s put them down and walk toward it. In essence, that’s what the starship Enterprise has always done, and what the end of this film sets up for them to do again. My single favorite line from Chris Pine’s Captain Kirk sums up the triumph enjoyed by everyone at the end of this film. Even through all of the witticisms and the clever, intuitive plot of Khan, Kirk looks out into the endless expanse before him, and with sheer wonder in his voice asks his first officer and friend, “where should we go?” That was the best possible way to end this movie. The promise of the unknown with warp drive, deep space, and a lot of time. 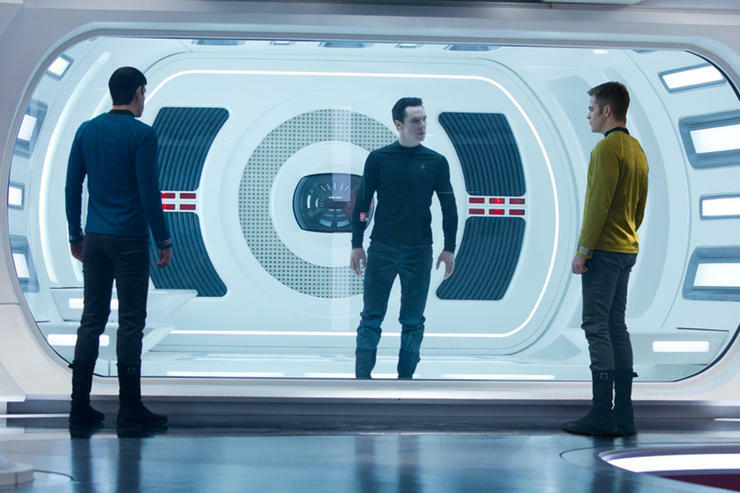 Was Star Trek Into Darkness what we want most from the franchise? No. Though because it recognized that and made that component of criticism a part of the story, I think that makes it one of the best Star Trek experiences someone could have. From an audience made up of hard-core Trek fans and total neophytes, we get to learn the value of that spirit of exploration all over again. Like the last film before it, Star Trek Into Darkness made me fall in love with the essentials of why I love the stories, characters, and situations all over again, and that’s why so far this summer movie season, I don’t think you’ll find a better blockbuster.